GOTHENBURG, Sweden, October 19, 2015 (ENS) – The ElectriCity project launched its campaign Silent Bus Sessions in the last week of September, featuring Swedish artists Zara Larsson and Seinabo Sey performing acoustic concerts for unsuspecting passengers on the new electric bus route in Gothenburg. The videos of their impromptu shows have gone viral and have topped 2.5 million YouTube views. See the music videos and “Behind the scenes” video here. “With this campaign, we have been able to reach the general public and communicate one of the benefits of electric buses – the silence on board. The music videos have received a lot of attention, especially on social media. It is great to see that the interest for sustainable public transport is so big,” says Niklas Gustafsson, chief sustainability officer, Volvo Group. ElectriCity is a collaborative project among academics, industry and the public sector aimed at developing, demonstrating and evaluating new sustainable public transport systems for the future. ElectriCity project is attracting international interest due to the CityTalk blog. It is run by ICLEI, a global network of more than 1,000 cities all working towards a sustainable future. Gothenburg has been part of the network since 1992. Testing and evaluation of electric bus transport is a central part of ElectriCity. Silent, emission-free public transport can operate in places where traffic is currently banned. This opens up new possibilities for urban planning in towns and cities, says Volvo, the company that made the electric buses. Besides the three completely electric buses, the route has electric hybrid buses that run on electricity for approximately 70 percent of the route before switching to petrol. The three electric buses run on renewable wind power and are energy-efficient, silent and completely emission-free. The buses run on batteries that are quickly recharged with renewable electricity at the terminal bus stops. Passengers have access to onboard wi-fi and phone charging facilities. The Teknikgatan bus stop in Lindholmen has an indoor terminal, showcasing the zero-emissions nature of the electric buses. 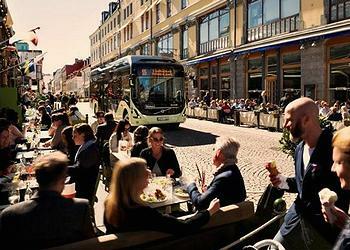 Volvo and the City of Gothenburg, which is Volvo’s headquarters city, realized that they share the same vision of developing a sustainable public transport system and demonstrating it in Gothenburg. The idea of a common project was born. In Gothenburg, under the ElectriCity banner, industry, researchers and civil society are now working together to develop, test and demonstrate solutions for the future sustainable public transport system, a cooperation stretches to 2018. Its participants are the Volvo Group, the Västra Götaland Region, the City of Gothenburg, the Chalmers University of Technology, the Swedish Energy Agency, the Johanneberg Science Park, the Lindholmen Science Park, the Business Region Göteborg, Göteborg Energi, and Västtrafik.